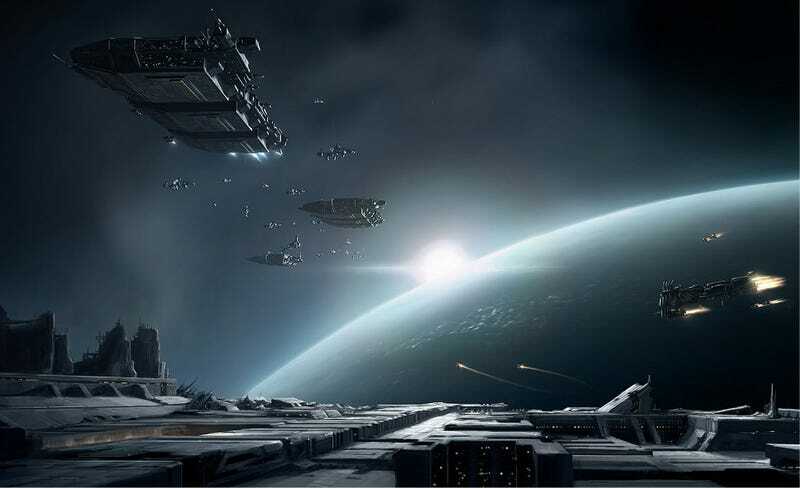 Can Galactic Empires Exist Without Faster-Than-Light Travel? My newest science fiction novel, Lockstep, was recently serialized in Analog magazine. Reactions have been pretty favourable — except that I've managed to offend a small but vocal group of readers. They're outraged that I've written an SF story in which faster than light travel is impossible. I did write Lockstep because I understood that it's not actual starflight that interests most people—it's the romance of a Star Trek or Star Wars-type interstellar civilization they want. Not the reality, but the fantasy. Even so, I misjudged the, well, the fervor with which some people cling to the belief that the lightspeed limit will just somehow, magically and handwavingly, get engineered around. This is ironic, because the whole point of Lockstep was to find a way to have that Star Wars-like interstellar civilization in reality and not just fantasy. As an artist, I'm familiar with the power of creative constraint to generate ideas, and for Lockstep I put two constraints on myself: 1) No FTL or unknown science would be allowed in the novel. 2) The novel would contain a full-blown interstellar civilization exactly like those you find in books with FTL. Generations of thinkers have doubled down on trying to solve the problem, unaware that the problem is not the same as the issue. The problem — of generating enough speed to enable an interstellar civilization — may be insoluble; but that doesn't mean the issue of how to have a thriving interstellar civilization can't be overcome. You just have to overcome it by solving a different problem. The problem to solve doesn't have to do with speed (or velocity, for you purists), but rather with duration. Enter Lockstep. In the novel, all worlds, all spacecraft and all habitats participating in a particular civilization use cold-sleep technology "in lockstep:" the entire civilization sleeps for thirty years, then simultaneously wakes for a month, then sleeps for another thirty years, etc. All citizens of the lockstep experience the same passage of time; what's changed is that the duration of one night per month is stretched out to allow time for star travel at sublight speeds. In the novel I don't bother with interstellar travel, actually; the Empire of 70,000 Worlds consists almost entirely of nomad planets, wanderers populating deep space between Earth and Alpha Centauri. Average long-distance travel velocity is about 3% lightspeed, and ships are driven by fission-fragment rockets or 'simple' nuclear fusion engines. The result is a classic space opera universe, with private starships, explorers and despots and rogues, and more accessible worlds than can be explored in one lifetime. There are locksteppers, realtimers preying on them while they sleep, and countermeasures against those, and on and on. In short, it's the kind of setting for a space adventure that we've always dreamt of, and yet, it might all be possible. Cold sleep technology is theoretical, but unlike FTL, it's not considered out of the question that we could develop human hibernation. It's a bio-engineering problem, and probably admits of more than one solution. It's an easier problem to solve than FTL, in other words. And by solving it, and using locksteps, we have a universe where travelers can go to sleep at their home port, wake up the next day at a world that could be light-years away, spend some time there and, when they return, find that exactly the same amount of time has passed at home. Locksteps give you the effect of FTL, without requiring FTL. I won't go into all the implications—that's what the novel's for. But, to circle back to the idea of creative constraint, by requiring an FTL-like civilization without FTL, I stumbled into a whole new universe. In the world of Lockstep, there are Sleeping Beauty-like tales, a version of the Twin Paradox, and an even stranger paradox in which the newest immigrants to the lockstep have the longest history with it… It's no exaggeration to say that many books could be written in this world without exhausting its possibilities. Maybe I'll write more of them myself. Meanwhile, the idea's out there. It's a bit crazy, but it's a possible solution to an issue, that avoids having to solve an impossible problem. A constraint that gives us a way to reach the stars. Tor Books will have Lockstep on the bookshelves March 24. This article originally appeared at Centauri Dreams. Top image: Borkur Eirksson/concept art Copyright of CCP Games. More here.